Publishers' archives are valuable but underutilised sources of information about writers and their books, particularly writers who are little-known, or who worked under pseudonyms. As far as I know, the largest archive of British publishers records is housed at the University of Reading, in the archive of publishers and printers. An important set of archives that is more accessible than most is the Archives of British Publishers, which comprises the records of nine publishers copied to microfilm and microfiche, including George Rutledge, Elkin Mathews, Grant Richards, and Richard Bentley. It can be found in many major libraries. A good example of how publishers' archives can be used is the case of the nineteenth century supernatural fiction writer, Keith Fleming. Fleming wrote three works of supernatural fiction published by George Routledge between 1889 and 1891, Can Such Things Be?, By the Night Express, and At the Eleventh Hour. The specialty publisher, Sarob, reprinted the first two in 2001 in a nice limited edition volume. The George Rutledge papers in the Archives of British Publishers includes the contracts for the three Keith Fleming books. The signature on all three contracts is K.E. Fitzpatrick, indicating that ‘Keith Fleming’ was in fact a pseudonym. Two of the books also appear in Rutledge's book production ledgers. Can such things Be? was printed in a run of 4000 and 25 pounds was paid to “Miss Fitzpatrick”. At the Eleventh Hour was also printed in a run of 4000 and 25 pounds was paid for the copyright. It turns out that "Keith Fleming" was in fact Kathleen Fitzpatrick, born in Ireland in 1858 or 1859, and who lived for much of her life with her widowed mother in Wales, not to be confused with the Kathleen Fitzpatrick who wrote The Weans of Rowallan. The year 2011 has brought us not one but two new issues of the excellent French magazine on the fantastic, Le Visage Vert. Issue 18 came out this summer, and issue 19 has just recently appeared. 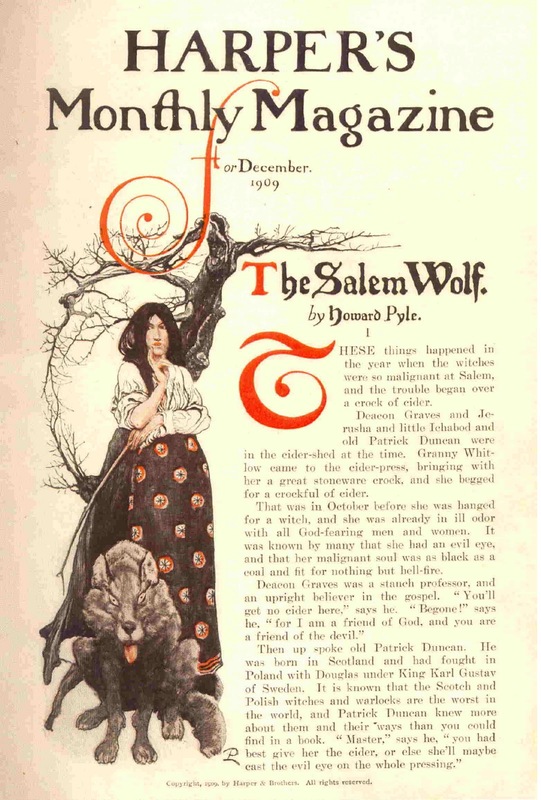 Issue 18 (June 2011) begins with a translation by Anne-Sylvie Homassel of Howard Pyle's "The Salem Wolf", with the original illustrations from the December 1909 appearance in Harper's Monthly Magazine. This is followed by Michel Meurger's essay on the Salem witches in American literature. Other work translated from English into French include Robert Barr's "The Vengeance of the Dead" (with illustrations from its English Illustrated Magazine appearance in May 1894) and Amelia B. Edwards's "A Railway Panic" (1856). Two stories reprinted in their original French are "Une heure d'express" and "Le Roi du Léthol", both by Georges Price (1853-1922), from his volume La Rançon du sommeil (1910). The first story seems a direct descendant of the Amelia Edwards story. And two stories by Alexander Moritz Frey (1881-1957), along with an essay on him by Robert N. Bloch, are translated from the German. A full contents-listing for this issue can be found here. A supplementary envelope that comes with this issue includes three cards, printed in color on both sides, showing some of the dynamic illustrations in full color, including three pages with illustrations by Howard Pyle for his own story. Issue 19 (November 2011) is another bountiful volume. It includes stories by René Thévenin (French, 1867-1967), Harry de Windt (British, 1856-1933), Rhoda Broughton (British, 1840-1920), Ernst Raupach (German, 1784-1852), and the contemporary H.V. Chao (American, the pseudonym of translator Edward Gauvin). 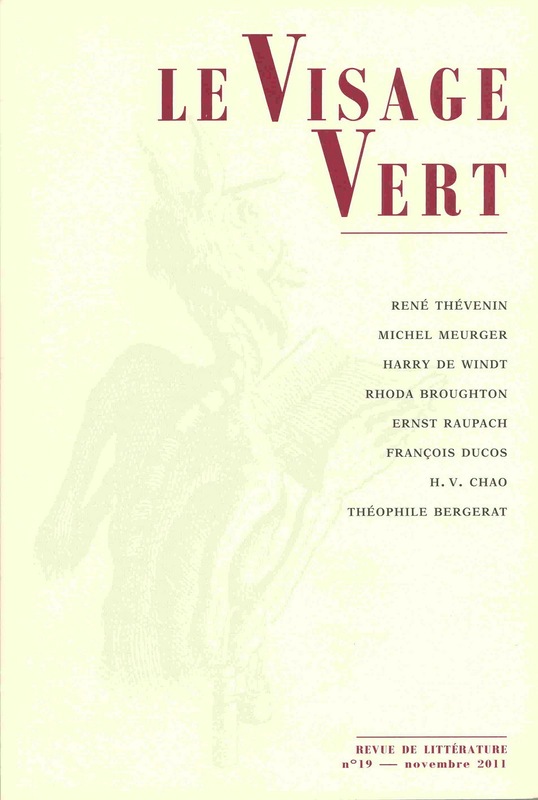 Criticism by Michel Meurger and François Ducos. A full list of contents can be found here. And there is similarly a supplementary envelope with colored cards. Personally, the item of greatest interest to me is the fantasy story by the forgotten German dramatist Ernst Raupach, whose famous vampire story "Wake Not the Dead" (published 1822, translated into English without attribution in 1823) has long---in English---been misattributed to Ludwig Tieck. Raupach's story, "Die Wanderung", is a fairy tale very much like the ones that would be written afterwards by George MacDonald. 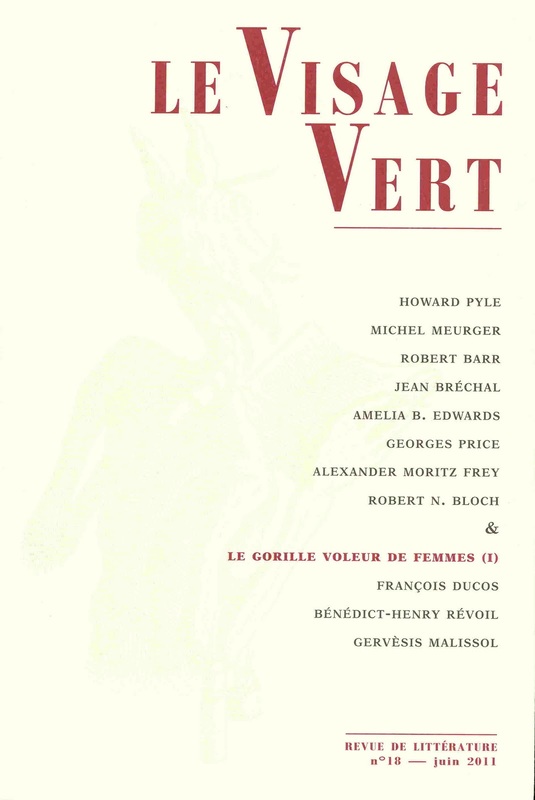 All of the publications of Le Visage Vert are elegantly and tastefully produced. You can see a full list (and order via Paypal) at this link. (Scroll down for the current and back-issues of Le Visage Vert). There is a for me a special interest in seeing video or hearing a voice recording of a long-dead favorite author. I have heard some recordings of Arthur Machen, an author typically associated with the 1890s, and it almost felt like having a time machine when I heard his lilting voice. I have never heard any recording of Lord Dunsany, but suspect some may survive, owing to his broadcasts on the BBC. There are various recordings and even some video footage of Tolkien, but I doubt I'll ever hear the voice of David Lindsay (alas!). Or Kenneth Morris. Or E. R. Eddison. I knew from Mike Ashley's excellent Algernon Blackwood: A Bio-Bibliography (1987) that late in life Blackwood did radio and television broadcasts. And some years ago some surviving clips of one of these 1951 television programs showed up in a BBC4 show "The Story of the Ghost Story", broadcast on December 23, 2005. I hoped (in vain) that this show might appear somewhere on US television, but it never did. No DVD came out either, but at last I've found it on YouTube. The program is just under thirty minutes, and on YouTube it appears in two parts, part one and part two. The snippet of Blackwood (less than twenty seconds) appears in part two, from the 6 minutes and 51 seconds mark, through 7 minutes and 9 seconds. Not much, but it is a privileged glimpse at the man, and it whets your appetite for more. If more footage of Blackwood and other such classic authors survives, and could be complied on a DVD, I'd be first in line to buy it. Major W.F. Morris wrote a masterpiece of First World War fiction that won strong acclaim at the time from critics and fellow authors. Not only was it an authentic account of conditions at the Front, it was also a remarkable thriller, with a highly unusual plot, which won him comparisons to John Buchan and the best of the espionage writers. He was right: it was the first novel by Walter Frederick Morris, a Norwich man who was born there on 31 May 1892, stayed there – apart from his war service – and died in that city in 1969. Morris had been commissioned at the age of 22 as a 2nd Lieutenant in the 13th Cycle Battalion of the Norfolk Regiment in November 1914, went to the front in 1915, and by the time he was demobilised, at the late date of June 1919, no doubt a rather old 27, was a Major. He was to write six more novels after Bretherton. And as yet, it has been hard to uncover very much more biographical information about Major Morris. There is a self-effacing, fussless, just-get-on-with-it quality to some of the most attractive characters in his books, that I suspect their creator may have shared. Bretherton (1929: US title, "G.B.") is set in the confusion and futility and weariness – but also the elation - of the last days of the war, when a British raiding party stumbles upon an eerie tableau in a ruined chateau, under fire. Following the strains of a familiar tune, “Just a Song at Twilight”, and understandably perplexed by who would be playing a piano in the middle of an ambush, they discover a British officer, dead across the keys, with a beautiful but also dead woman, in a fine formal gown, lying on a couch close by. And the British officer is in German uniform, the uniform of a General. The scene gives force to the book’s sub-title: Khaki or Field-Grey? The rest of the novel unravels the clues to the meaning of that haunting scene. But it also does so much more than that. Four qualities give the book its particular force and attraction. The first of these is its handling of humour, a gentle, pervading quality that is integral to the book, not a forced contrivance. Morris seems to faithfully recall the banter and badinage in the trenches, the absurdity of incident, the incongruities of civilised men in distinctly uncivilised conditions, as well as the gallows humour and a seasoning of satire at the fatuities from the high gods of HQ. However tense his plot, however squalid the scenes, there is never far away this under-stated, lightly ironic counterpoint. The second is Morris’s handling of the mystery element. This is built up subtly by well-placed minor incidents, by half-glimpsed perspectives from characters who enter the narrative at a tangent, by shadings and hints. The mystery is the focus of the book, yet the work is not subservient to it. The third quality, and the one that struck contemporaries most, is its realism. One said that “men who went through the war will have respect for and interest in Bretherton”. There are unflinching, but brief, scenes of horror, such as we know also from the memoirs and literature of his more celebrated contemporaries. There is – unemphasised but clear – evidence of the futility of hard-won advances swiftly abandoned. The boredom and the banal brass-hattery of the war comes across well too, though lightly done. Morris evokes well the camaraderie of the trenches, but he is also not afraid to acknowledge the rivalries, dislikes, vexations and minor feuding. Lastly, there are the things that Bretherton is not. It is not preachy: it has no overt agenda. There is no “King and Country” stuff, no sentiment, no prejudice against the enemy: and, indeed, perhaps uniquely, it is written from both sides of the war. All of these elements make Bretherton an astonishingly finely balanced, quiet masterpiece. That Bretherton was no accidental achievement is evident from two at least of Morris’s subsequent novels, both with settings involving the Great War. Just as in Bretherton, they are concerned with questions of identity, allegiance, chance, concealment and self-discovery. His second book, Behind the Lines (1930), is almost a match for Bretherton, and a commentator noted that “in spite of the flood of war books”, Morris was able to achieve “a quite different viewpoint from all the others”, and his book was “an outstanding success”. A subaltern is forced to flee when he accidentally kills an overbearing, taunting fellow officer: appearances are all against him and he does not trust to trench justice. He becomes a fugitive and has to make alliance with other deserters, lost soldiers and outlaws in a hand to mouth existence in the no man’s land that the opposing forces aren’t occupying. A clever, and just plausible, plot twist sets matter right. His third novel, Pagan (1931), though set in peace time, unravels a macabre mystery that derives from the war, and again is founded upon the themes of lost identity, the outsider and tested loyalties. It is almost as powerful as the first two. Again, it has a sound mystery element, engaging characters, and well-described settings in the French countryside, still torn from the war. It is somewhat harder to find than the first two. All three books have at their heart a Jekyll & Hyde type theme, where both Jekyll and Hyde are understandable and may win our sympathy: a very difficult feat to pull off. After these, Morris wrote four more novels that are more conventional adventure thrillers, but with his trademark flair for keen action, lively characters and unusual plotting. They followed at a pace of one every two years, until the last in 1939. The title of his next book, Something to His Advantage (1935), is from the wording of adverts placed by solicitors to trace missing legatees named in wills, asking them to make contact to learn about their good fortune. A young solicitor and his detective-novelist friend journey to a remote Norfolk village to give just such news to a reclusive beneficiary – who does not survive to hear it. The pair launch their own investigation. It’s a breezily-written, engaging enough yarn, but missing the strangeness and originality of his earlier work. In No Turning Back (1937), two ex-soldiers with a flippant wit and devil-may-care attitude are drawn into a treasure hunt for Spanish gold. Unfortunately, they are not the only ones after it and find themselves chased – or chasing – halfway around the world. Both characters are enjoyably drawn and are a cut above the Sapper type of heroes, not least because they don’t take themselves too seriously. They return in Morris’ last book, The Channel Mystery (1939), in a plot which takes its lead from Erskine Childers’ The Riddle of the Sands. Only here, the enemy is lurking in the minor rocks and islets of the Channel Isles. It was perhaps fitting that the author who wrote so compellingly of the First World War should end with a warning of what was to come in the Second. After that, it is not clear whether Morris stopped writing or could no longer find a publisher. Yet there was one more ringing tribute. When in 1952 a master of the spy thriller form, Eric Ambler, identified his top five spy stories, four of them were very well known: The Riddle of the Sands by Erskine Childers; The Secret Agent by Joseph Conrad; The Thirty-Nine Steps by John Buchan; and Ashenden by W. Somerset Maugham. The fifth must even by then have seemed more obscure to Ambler’s readers. It was Bretherton by W. F. Morris.